Some quiet thoughts : Reflections: To be or not to be - battling for your dream. 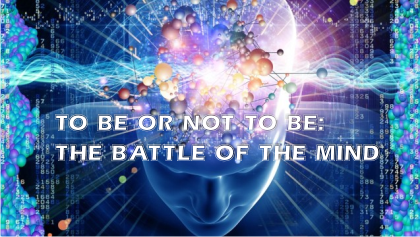 To be or not to be - battling for your dream. As Christians we often have a very passive and ‘peaceful’ outlook to things that happen in our lives and can be fooled into thinking we are to accept everything that is flung at us without fighting back.I have heard a great man of God say “the Christian life is not like a battle but it is a battle”. Whatever happened then to this peaceful person called a Christian? That statement does not seem to have room for ‘peace’ or passivity. Anybody who has been a Christian long enough can identify with the above quote. We know how we struggle within and without. Being kind, forgiving, patient and forbearing is not easy. It is a battle. When tempted to sin in thought, word or deed there is battle at hand to resist the force of the flesh and surrender to the way of the cross which is dying to self. How do we “take arms against a sea of troubles and by opposing, end them”? I have been thinking about this. I have been reflecting on area where we do this. I think the first place is in the mind- that’s where most battles are fought and won.” For our struggle is not against flesh and blood, but against the rulers, against the authorities, against the powers of this dark world and against the spiritual forces of evil in the heavenly realms.” ( Eph 6:12). I have found that it is here that the fiercest battles are fought. For years, I had to fight to keep a God given dream alive .The battle against crippling discouragement demanded that I rise above it and look to God for my strength and enabling. The battle against my own negative thoughts meant I had to learn to put no confidence in the flesh but to confess that “His power is made perfect in my weakness”. The battle against lack of help and outside support meant I had to learn to forgive and move on saying He is my sufficiency ( 2Cor 12:9) and my competence comes from Him ( 2 Cor 3:5).He is able to give me everything I need for life and godliness ( 2 Peter 1:3). IT WAS A BATTLE! If I had continued to stay passive, I would have stayed unfruitful, become despondent and depressed and not gone on to fulfill God’s plans for my life. Is the battle over? Has it ended? I wish I could say a resounding “Yes”, but the truth is far from it. The good news is that I am gaining victory over the toughest battle – that is my own mind ( where the battle continues to rage but I am better equipped now), my own lack of faith and wanting to giving up. To maintain the ground I have won, I need to keep fighting . And this fight is not won on a bloody battle field but at the foot of the cross where every battle was fought , won and proclaimed to all of history with the biggest most confident victory cry of all :”It is finished”. I have decided that I will be the one who takes arms against a sea of troubles and by opposing, end them thus fulfilling those God given dreams for the glory of God!